This three-year project aims to build municipal and community capacity on developing gender-sensitive sustainable energy solutions for low-income households through a participatory approach. The project is borne out of the need to tackle barriers in the implementation of climate-friendly plans and projects specifically in urban low-income areas. A key objective is to build capacity in communities such that they can meaningfully engage with local government to work together in addressing energy poverty. SEA will be working with two to three select municipalities over the course of this project. The project began in 2016, working with the City of Johannesburg-EISD and GENDER CC - Women for Climate Justice. In 2017, the project partnered with George Local Municipaloty through the Electro-Technical Service Department. 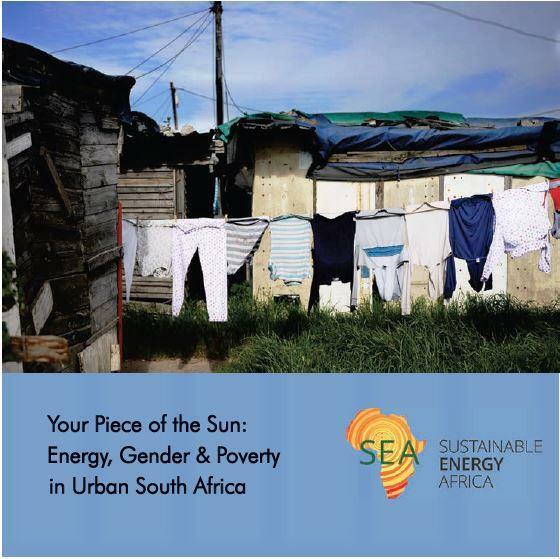 As a resource, the project developed a short, captivating film to provide a background on urban energy poverty in South African cities, for municipalities and communities alike. Through illuminating case studies and interviews with people on the ground, new approaches and innovative solutions to energy service delivery for low-income households are illustrated. “Your Piece of the Sun”, (25 minutes long) was produced by Lloyd Ross and Joelle Chesselet for Sustainable Energy Africa. This project would seek to strengthen current initiatives and would ultimately lead to the development of an energy poverty action plan for the municipality. Capacity building with the municipality, business, NGOs and communities on ‘how to do things differently’, alternative energy technology options and how to implement the action plan.